The most delicious grain-free Christmas treat you will ever eat. This festive Yule Log recipe is free from most common allergens and is paleo friendly! I’m not going to lie and say this is the easiest recipe in the world because it’s not exactly simple. However, it is the most delicious, naturally grain-free Yule Log you will ever eat which makes it SO WORTH IT. 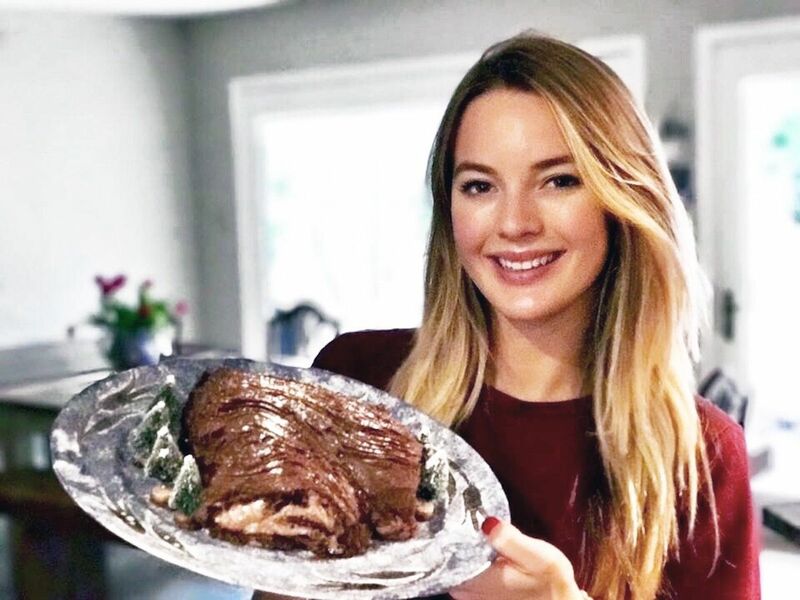 In case you aren’t familiar with this fabulous Christmas treat, here are some quick facts about the Yule Log (or Bûche de Noel as it's also known as). 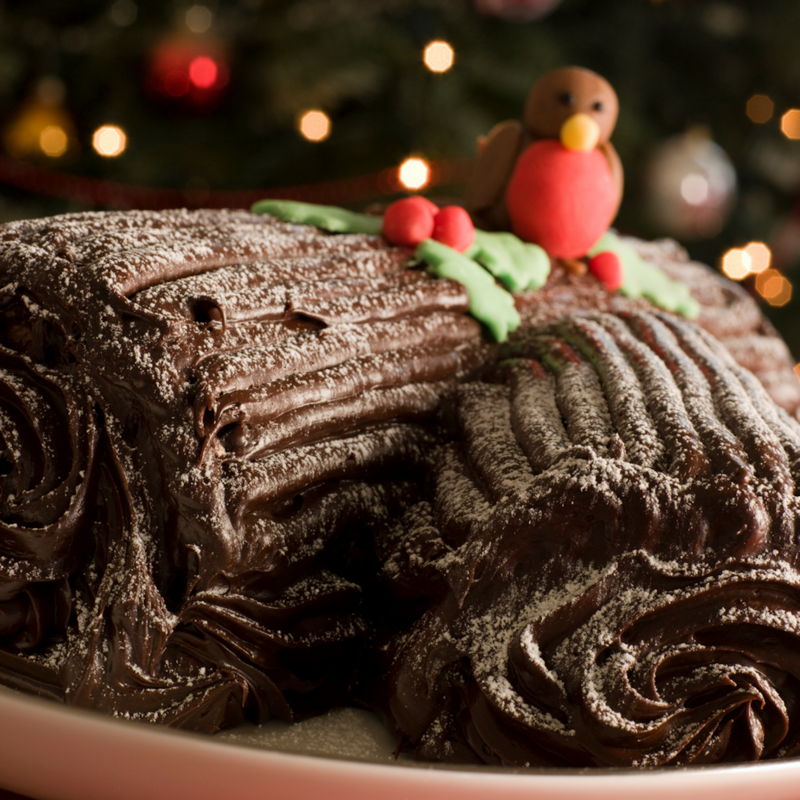 The Yule Log was invented by a French pastry chef in the late 1800’s. It is hugely popular in European countries at Christmas time. It literally resembles a log, with a bark-like texture from a fork being dragged through the frosting and powdered sugar to resemble snow. People often buy little Christmas ornaments and decorate the plate too. It's seriously GOOD- similar to a Swiss roll, but more festive and with extra trimmings. Although there are many recipes out there for a traditional log, there aren’t many grain-free, paleo friendly ones! It’s typically made with refined flour, dairy products and heaps of white sugar. Feel free to sub out the filling and frosting for either your own recipes or store-bought options if you aren’t feeling like making it from scratch. Whatever you decide, your festive Yule Log is guaranteed to be a showstopper at your Christmas party. Preheat the oven to 375 degrees. Line a Swiss roll pan with parchment paper and lightly grease with coconut oil. In your food processor or a mixing bowl, beat egg whites on high until soft peaks form. Slowly add ¼ cup sweetener of choice, until stiff peaks form. Transfer into a separate bowl. Add yolks to the processor. Beat yolks at high speed and then slowly add remaining sweetener until thick. Switch to a low speed and add cacao powder, vanilla and salt until smooth. Fold in your egg whites to your yolk mixture until just blended. Spread evenly in the Swiss roll pan and bake for 15 minutes. Place a clean tea towel on the kitchen surface and sprinkle lightly with arrowroot powder (or other flour/starch to reduce sticking). Flip cake onto your towel and peel off parchment paper. Starting with the short end, carefully roll your cake using the tea towel for support and when in a log shape, place seam down on a plate. Refrigerate while you make your filling. To make the filling, scoop the cold coconut cream into your food processor. Beat on high for 1 minute until fluffy, add sweetener and cacao powder and beat for another 2 minutes. Unroll the cake and spread filling all over the base. Carefully re-roll the cake to form a log shape and place on your serving platter seam down. Transfer to the fridge for 30 minutes to an hour. Finally, make your frosting by melting the chocolate chips and coconut cream over a glass bowl in a saucepan filled with boiling water. Stir until melted and smooth. Transfer to the fridge for a few hours until hard. It should be stiff but you can still make a dent with your finger. Remove from the fridge and allow to slightly soften for 15 minutes. Scoop the chocolate mixture from the bowl into a food processor and whip until fluffy. Using a sharp knife, slice the ends off the yule log at a 45 degree angle. Spread a little frosting on one end and use it to “stick” the ends of the yule log onto the top and side of the cake to look like branches. Spread your frosting all over the yule log. Make it look the part by running fork marks through the frosting and by topping it off with shredded coconut and festive faux decorations.